I've joined in the Orca Bay mystery. Do you think this is too obsessive? LOL I'm halfway through Step #1, and finished Step #2. 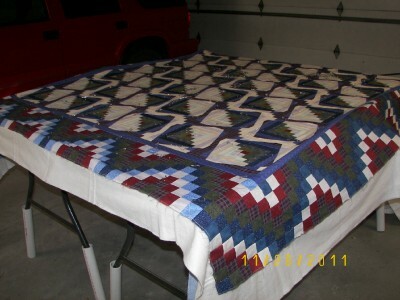 We had a few days of mid 50s, so I basted this last quilt outside in the garage, (below) before winter temps interfere. But my fingers were getting cold, and the sun was going down, and I was feeling old, and my feet were hurting, and, and, and, ... so I hurried. Some of the quilt was hanging over the end of the table and when I pulled it to the top for basting, I was lazy and didn't clamp it tight. Soooo, on that part that hung over, the result was pleats and puckers -- dang it!!! The only thing worse than basting, is re-basting. Below is a little Fons and Porte project that looked easy, do-able. I couldn't find decent double faced pre-quilted fabric at any of the not-so-local quilt shops, nor fabric shops, and decided I'd forget it, but lo and behold, checked under my bed, and found this really-old, good-quality pre-quilted, fabric. It's kinda homely, but it was my prototype. 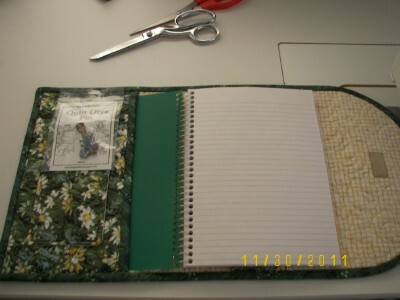 Inside I put a nice spiral bound tablet, about 6" x 9". The tablet has a pocket, so it might be good for grocery list or ???. 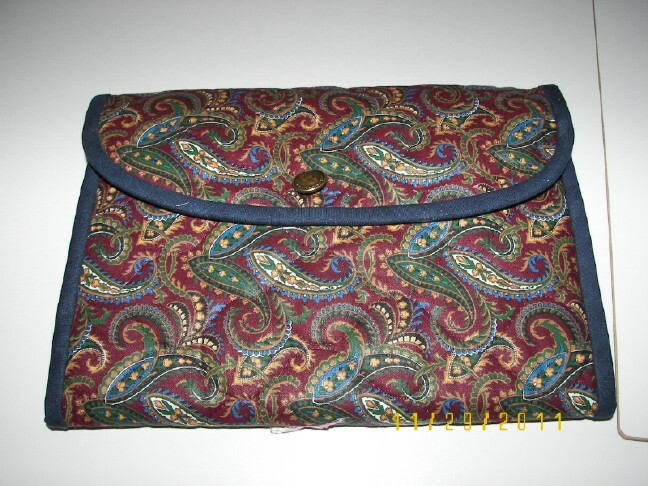 There is also a pencil/pen pocket. Do you have a huge jar of buttons? I've been carting around my button jar for over 30 years and STILL, could not find a decent button. This will have to do. 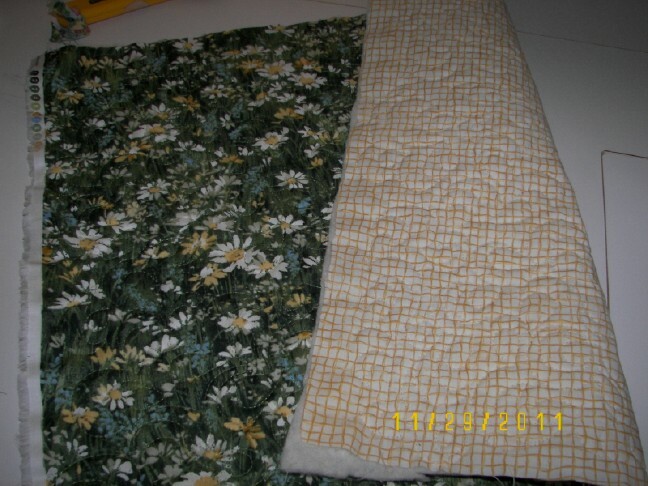 OK, I'll make another and this time, I'll quilt my own fabric. Supplies? 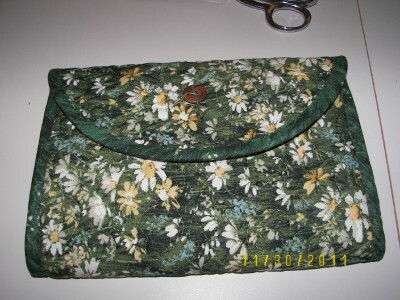 -- a FQ on front and another on back with leftover batting - all easy to find those in this house. 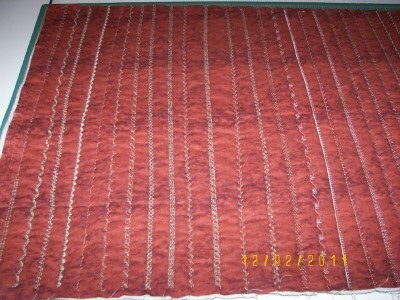 The quilting was good practice and it took about 20 minutes. Same project, and same issue with finding a decent button. Finally, I found a wood looking button and left some embroidery floss tails showing, for details. This looks better than my prototype! When I was finished, there was only a small amount of waste. Might want to give this to a quilting friend. Thursday nights was local Quilt Night with the gals, and I needed a project - I'll just make another folder, and quilt it myself, and this time, I'll try out those stitches on my machine for quilting. Come on gals, you KNOW you've been meaning to do this (if you haven't). None of the other gals had their machines, and we all agreed we've wanted to try out the fancy stitches, but none of us have actually USED them, so this was the perfect opportunity. I had several types of threads - a good way to use up small bits - and I started with #20 stitch, and planned to work through the last stitch, # 60. I use a Janome 760, lightweight portable that I use for classes, and to my delight, found it stitched very well!! In fact, within a few minutes, we all got involved with checking out the threads, ooohing and aaahing at the various stitches, and by the time we were through, we had all agreed we'd go home and try our own machines! What fun! So, this is my double-sided, pre-quilted fabric for the next folder. ﻿I stitched on the 18 inch measurement (length of grain) and found that these stitches reduced my crosswise measurement by about 2.5 inches. 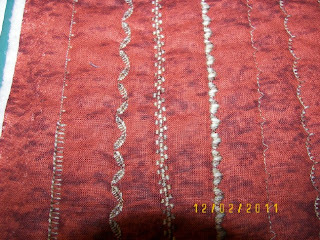 I stitched a line almost every inch, and some of the stitches were very dense. Lesson - if you try this on an actual project, measure AFTERWARDS. That is a nice little notebook cover. Nice gift item. I've been wondering how I will baste a king size quilt on 2 tables. It will definitely hang over like yours does. I adopted your method of basting in the garage and it does work very well, but I have a king size quilt project going and hope to have it ready to baste in January. A friend of mine with a HQ (?) quilting machine said I can use it, so I will hope to do that. I can relate to the button problem. I have TONS of buttons and when I went to look for black buttons for GS's shirt, I found 2 that were perfect and I needed 3. I finally sifted through lots more and came up with 3 that matched. The notebook holder looks good! Love your book covers, esp. 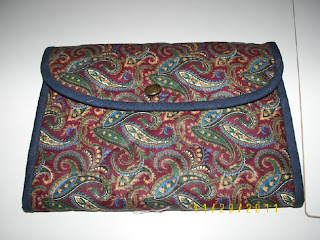 the paisley! Nice job, as always. 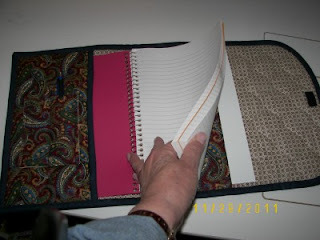 Your notebook covers look super. I like both fabrics. I guess that makes me an oldie, and a not so oldie! LOL! Those are great notebook covers. 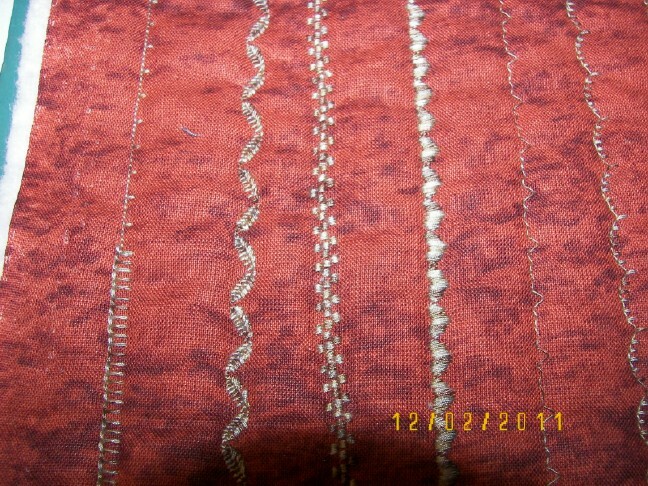 Where can I find the pattern? These would make nifty Xmas presents. And that's a good idea to quilt with your fancy stitches! Yes, I have tons of buttons, but none of them ever seem to be what I'm looking for when I need one! I made one of those notebook covers a few year back. I think I made it up from a Fons & Porter TV program. I ended up quilting my own fabric!! Yes...and I see you gave into the Orca Bay temptation. I am one of those who 'cheats' and waits to see what it looks like before I decide!! I know, I'm a weiner!! Love the notebook covers, they are addictive! I made some last year for presents, using my fancy stitches, I made circles! 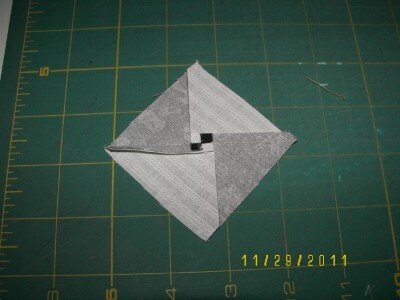 http://3creativestudios.com/freeprojects/circle.pdf is the site explaining the technique. Try it you'll like it!! You can see my notebooks on my blog: www.doniquilts.blogspot.com It's the Dec 15, 2010 entry!